Victoria Thornley will row for Great Britain at the 2016 Olympic Games despite doubts over her double sculls place, Sir Steve Redgrave believes. The Welsh athlete, 27, has been competing alongside Katherine Grainger. But Grainger's London 2012 gold medal partner Anna Watkins has returned to the sport after a three-year break. "There's no way they can have somebody of Vicky's standard that is not competing at the Games," five-time Olympic champion Redgrave said. "The quality of sculler and rower that she is, she will be going to the Games unless there is injury or illness." Thornley, who is 6ft 4in, underlined her quality last weekend by winning the women's single scull 5km trials race in Boston, Lincolnshire. Scotland's Grainger was second, while England's Watkins - who returned last April after three years out of the sport to raise a family - was 12th. "That shows the selectors and coaches that Vicky's in a pretty good place," said Redgrave, 53, who won gold medals at five consecutive Olympic Games between 1984 to 2000. "If you're the fastest sculler in the country, that's got to put you in a very good place. With Anna Watkins coming back... that's got to boost her [Thornley's] confidence. "Every trial, every assessment has proved that Vicky's the fastest female in a single scull. "So that is one element in a lot of elements that will go through to selection, but I think it's one of the crucial ones. If you're the fastest athlete in the country, that's got to put you in pretty good stead. "The big question mark over Anna Watkins was that she was down in 12th. "She's only been back in a few months but we always talk about Olympic year being a very short year... so will she be given time to get her fitness back? Can she get her fitness back? "There are a lot of 'ifs' over that." While Thornley and Grainger are the fastest individuals, there remain questions over their double sculls combination, with the pair only finishing sixth at the World Rowing Championships in Aiguebelette this year. "Not that it's a problem, but Vicky is a little bit taller than most - she's more my height than the other girls around her - and that sometimes makes it a little bit awkward in a crew boat," Redgrave said. "There is a thought that the combination between Vicky and Katherine didn't work as well as they hoped it would work. "When they go into the next phase of training, I think they will be swapping around partners; I don't think it's a given that Katherine and Vicky will be the double scull at the Olympics next year. "But if you're the fastest sculler, it's hard to make a change." The double sculls result at the World Championships was at least enough to earn a qualifying spot in the 2016 Olympic regatta, with two other places secured for Great Britain's women so far, in the eight and the pair. 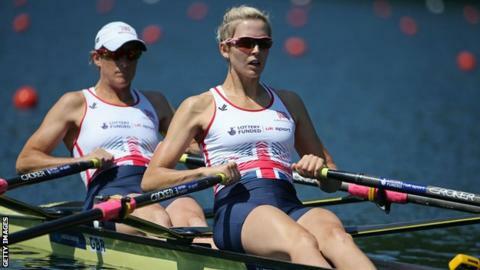 Helen Glover and Heather Stanning, who won GB's first gold at London 2012, are expected to continue in the pair. But if the selectors decide to make changes in the double sculls, Redgrave believes there is an argument for also trying out new combinations in the eight. "There is a very strong case for putting some of our best athletes into the eight to try to strengthen it on the fourth place that they had at the World Championships," he added. "Vicky would certainly make the eight go faster... and so would Anna and so would Katherine."